From 1997 to 1999, I served in the Peace Corps in the Andean country of Ecuador. Ecuador is rich with contrasts. With the Galapagos, the Andes, and parts of the Amazon, the country possesses stunning natural beauty. The people have an incredible generosity of spirit, yet the country is riven by racial and regional differences. Until recently, high oil prices papered over some of these differences, but the president, Rafael Correa, is a left wing populist in the tradition of Hugo Chavez. He has taken to castigating his domestic on-line critics through television naming and shaming efforts that are unbecoming for a head of state. John Oliver has a wildly funny take-down of Correa’s pompous self-importance, which prompted a vigorous response from Correa (some calling it an “international incident”) and another round of humor from Oliver. The original video is hilarious and worth a watch (I’m not sure if embedding worked on this video so here is the link here though I think clicking on the screenshot below will work). 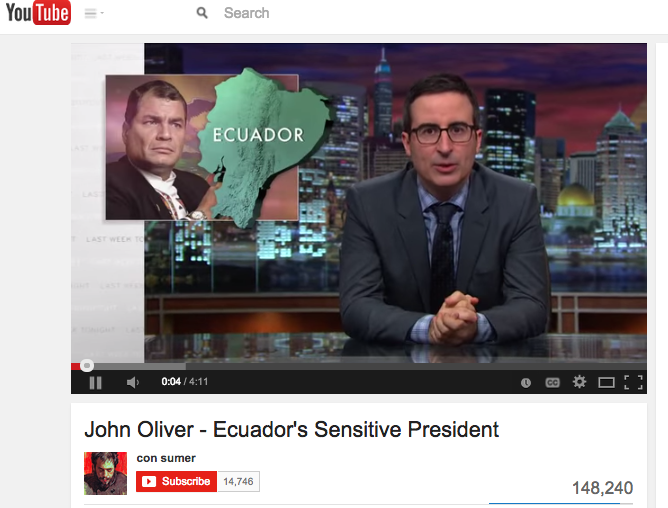 John Oliver’s take-down of Ecuador’s mercurial president is hysterical, but the next video by Peace Corps volunteer Kyle King is extraordinary. Kyle created this video with Peace Corps Week approaching as a way to honor his counterpart host family, capturing their tremendous grace and humor but also the hardships and tragedies that families endure. It’s hard to talk about the video without sounding maudlin, but I found it to be really powerful film-making and brought back so many memories of my own Peace Corps experience.